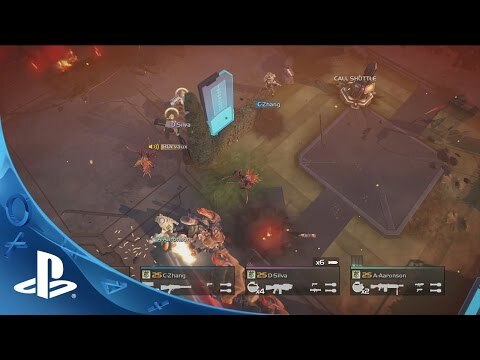 Brave HELLDIVERS have been locked in a triumphant galactic war since the title’s exclusive digital release on PlayStation® platforms in March 2015. COOPERATIVE GAMEPLAY – Teamwork is essential as all the action takes place on a shared game screen. As the difficulty increases, players will have to work together to complete objectives, co-pilot vehicles and use advanced weapons. CUSTOMISABLE LOADOUTS – Players unlock new weapons, gear and stratagems – such as vehicles and airstrikes – as they progress and can choose to use any combination of their favourite equipment on every mission. CROSS BUY AND CROSS PLAY – The physical PS4™ edition includes a digital copy of the PS3™ and PS Vita editions of the game. And thanks to the prowess of SUPER EARTH’s gifted technicians, all three versions of the game can be played together, with any combination of online and offline. JOIN THE HELLDIVERS, SEE THE GALAXY! Now the citizens of SUPER EARTH can join the epic fight against the enemies of humanity with a physical edition of the game including all DLC add-ons and expansion packs. HELLDIVERS has received high praise from critics and players alike for its deeply strategic and often chaotic approach to cooperative multiplayer. Perfectly poised as an easy-to-pick-up, difficult-to-master game with friends both online and offline, HELLDIVERS is filled with laugh-out-loud moments of friendly fire casualties and last-ditch heroics. The HELLDIVERS are the scalpel of SUPER EARTH’s military might. Squads of up to four of these elite soldiers are deployed deep into enemy territory in HELLPODS – individual re-entry capsules fired from command ships in orbit. Once on the ground, the HELLDIVERS must carry out a series of increasingly difficult objectives, such as rescuing survivors, activating and defending civilian assets or assassinating high-value targets. COOPERATIVE GAMEPLAY – Teamwork is essential as all the action takes place on a shared game screen. As the difficulty increases, players will have to work together to complete objectives, co-pilot vehicles and use advanced weapons.